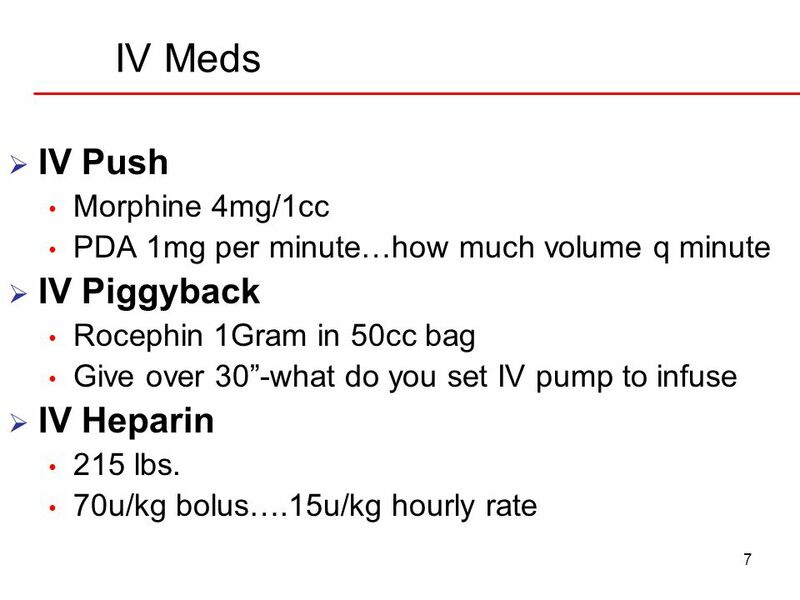 In a simulated clinical situation, demonstrate hanging an IV piggyback and calculate correct rate and set up on Horizon pump. 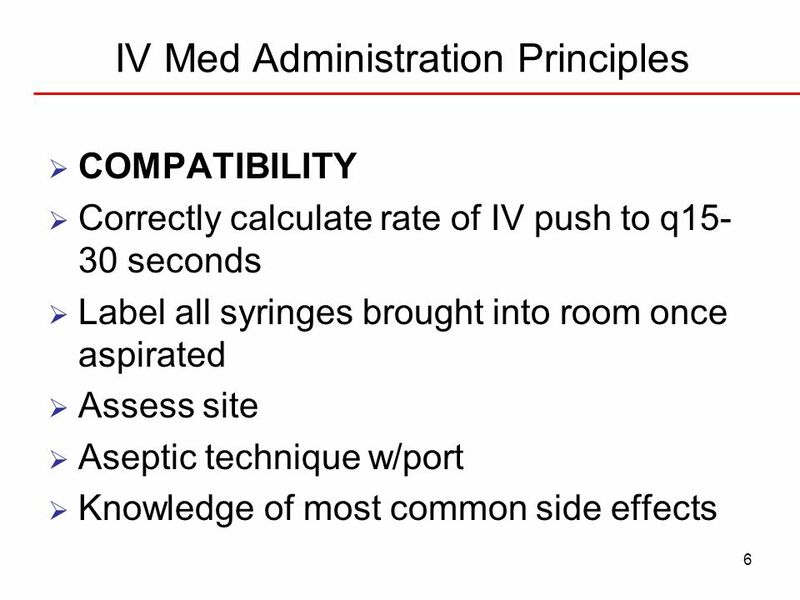 In a simulated clinical situation, demonstrate calculation to safely administer IV medication bolus per PDA and administer. 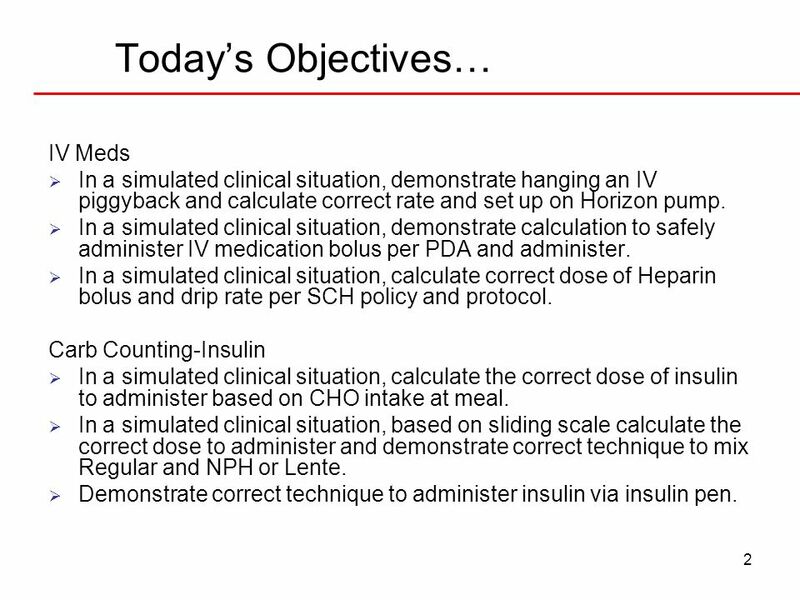 In a simulated clinical situation, calculate correct dose of Heparin bolus and drip rate per SCH policy and protocol. 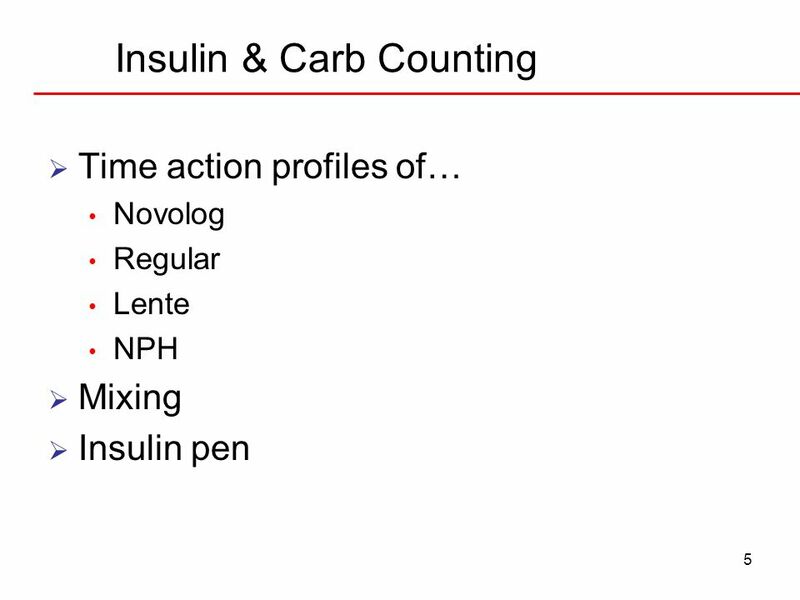 Carb Counting-Insulin In a simulated clinical situation, calculate the correct dose of insulin to administer based on CHO intake at meal. In a simulated clinical situation, based on sliding scale calculate the correct dose to administer and demonstrate correct technique to mix Regular and NPH or Lente. Demonstrate correct technique to administer insulin via insulin pen. 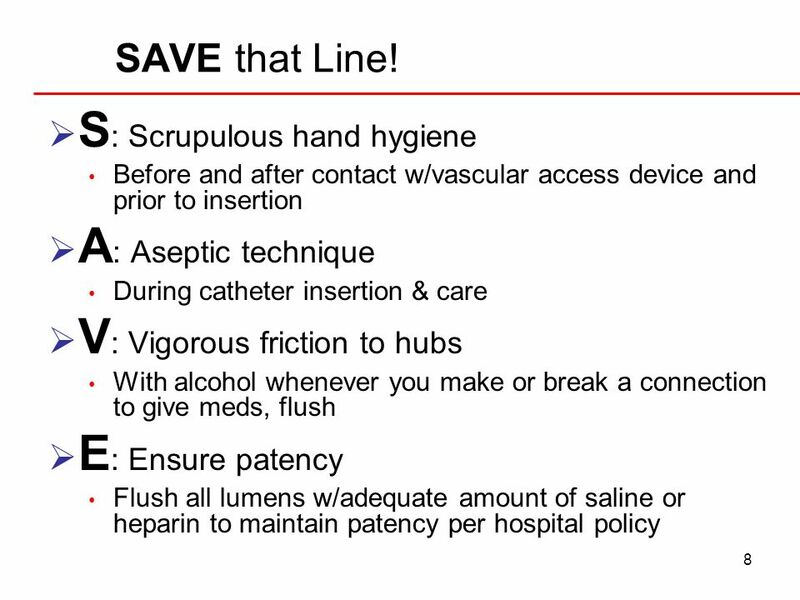 State the veins of the hands and arms that could be used for intravenous insertion for all ages. 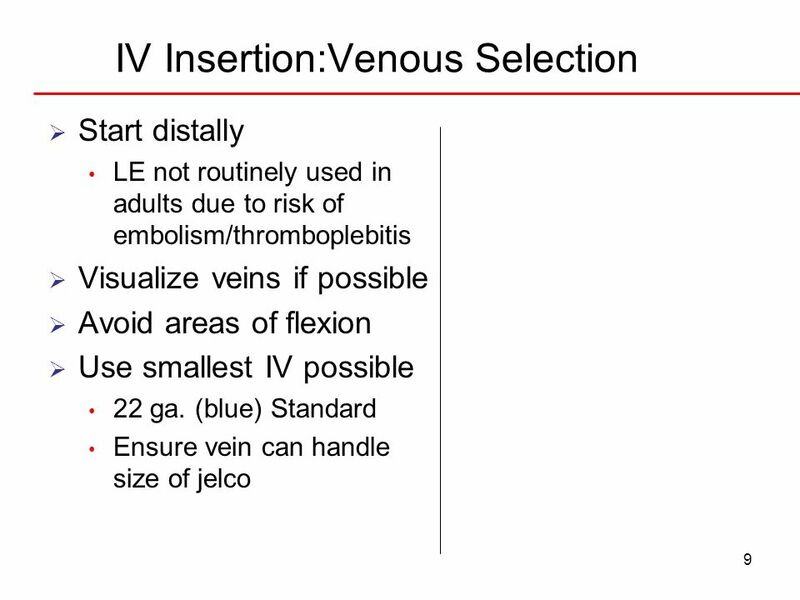 Implement measures to promote venous distention. 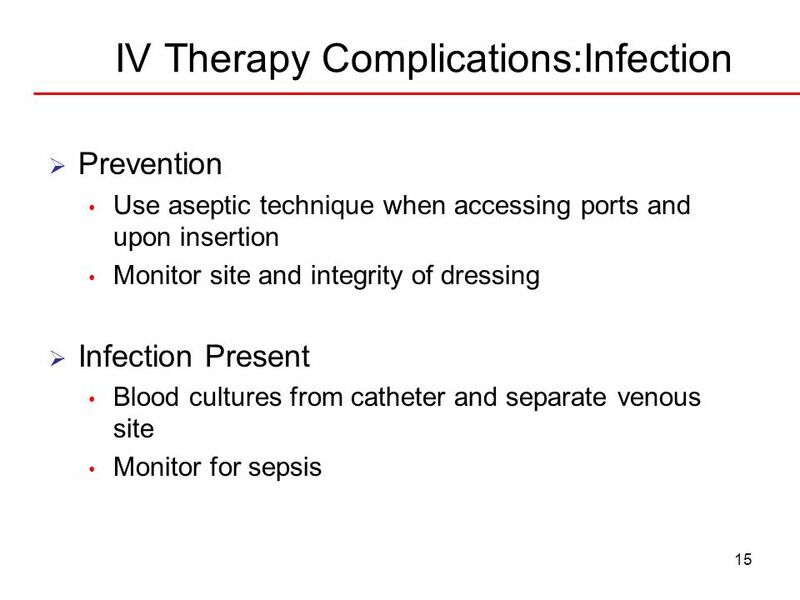 State potential complications when initiating IV therapy and measures to prevent complications. 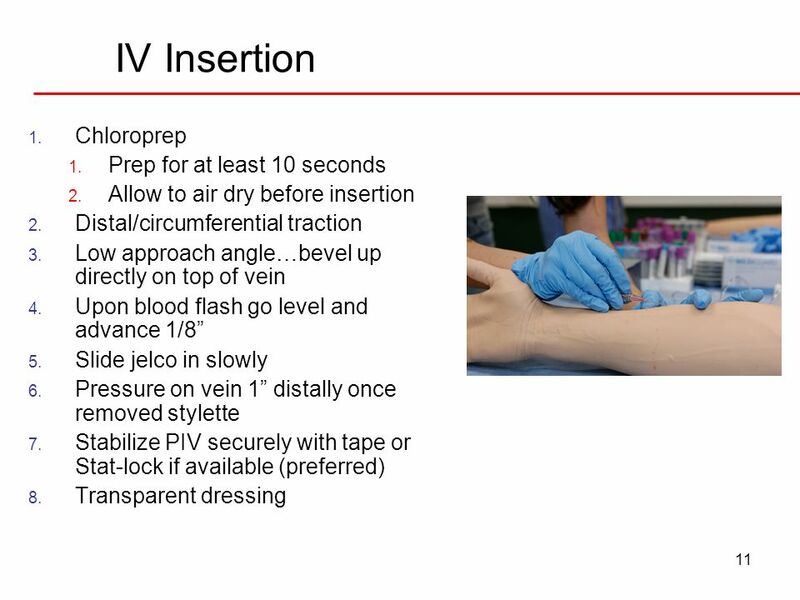 Demonstrate IV insertion, dressing of the IV site and application of a saline lock safely with the simulation arm. 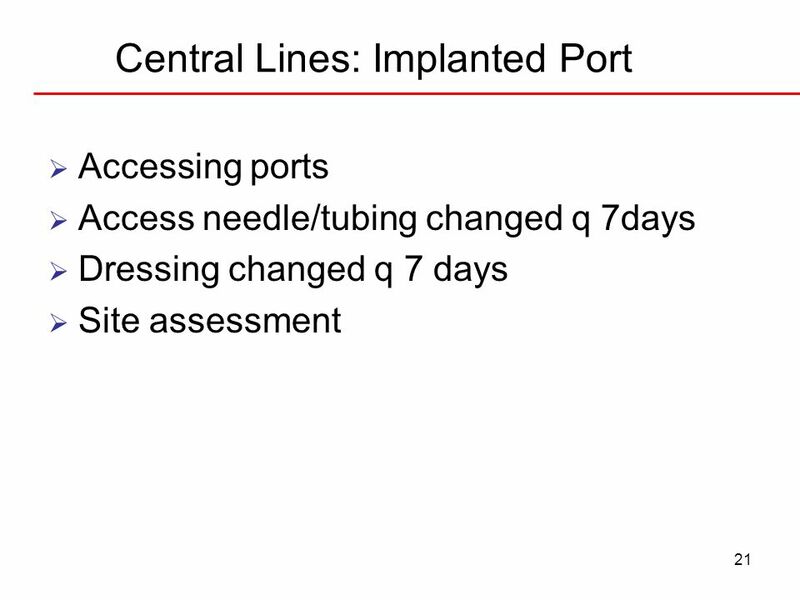 Central-Arterial Lines Identify indications for placement of central/arterial lines. 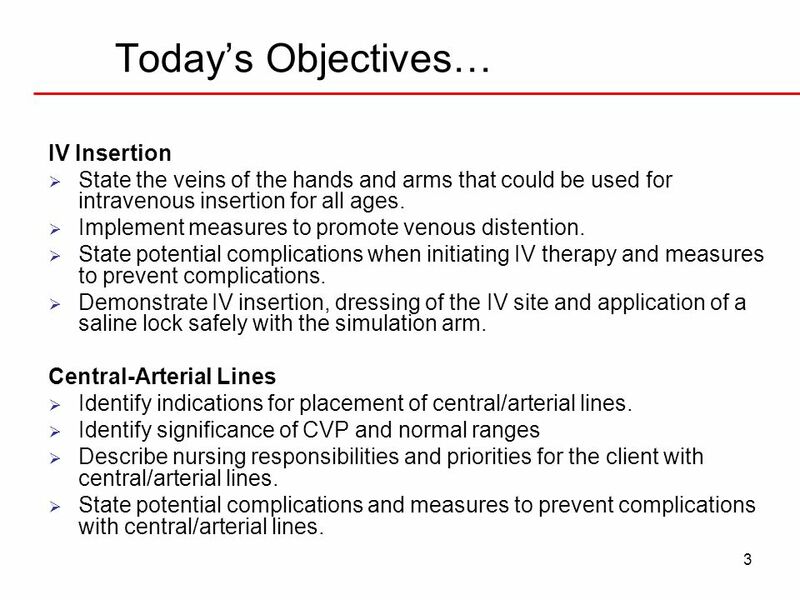 Identify significance of CVP and normal ranges Describe nursing responsibilities and priorities for the client with central/arterial lines. 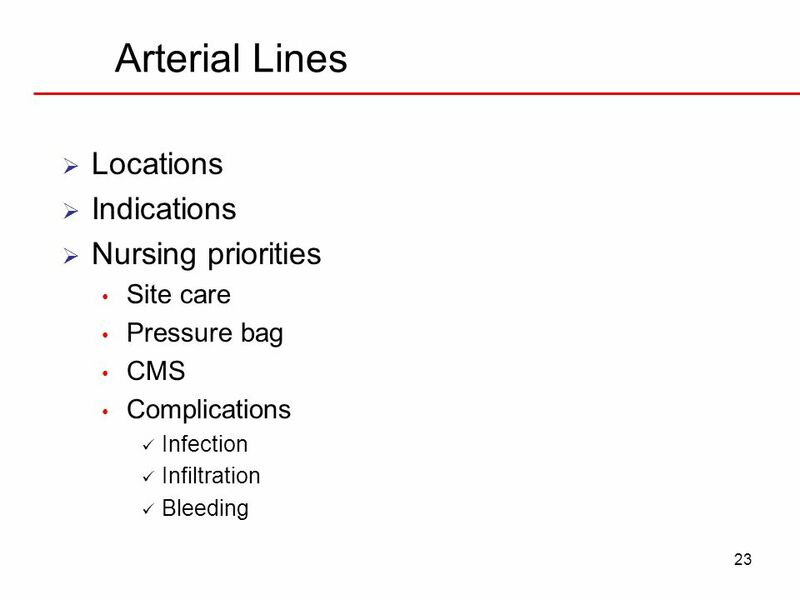 State potential complications and measures to prevent complications with central/arterial lines. 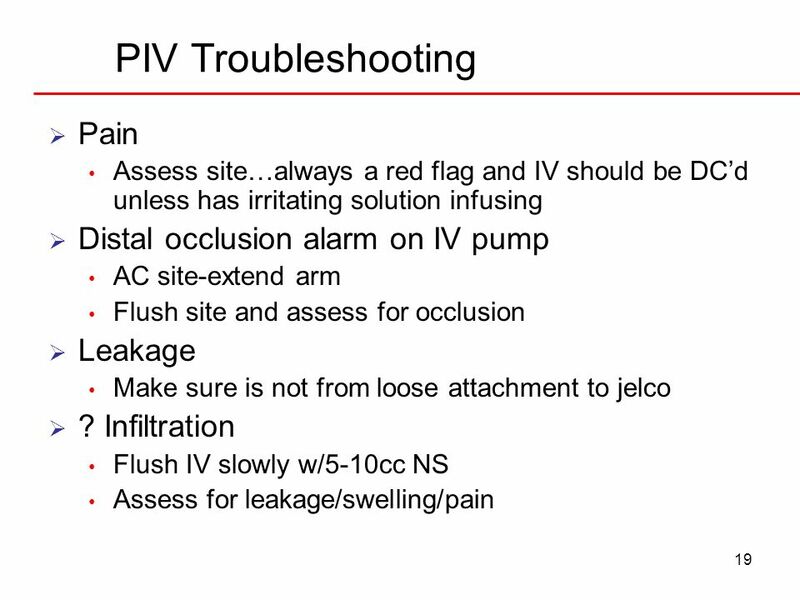 Identify indications for placement of chest tubes. Describe the principles and patho that support the use of chest tubes. 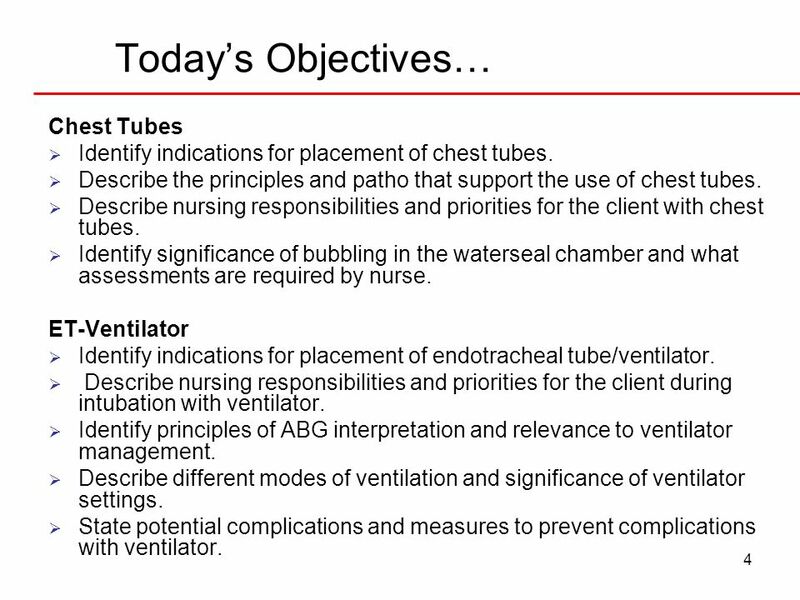 Describe nursing responsibilities and priorities for the client with chest tubes. 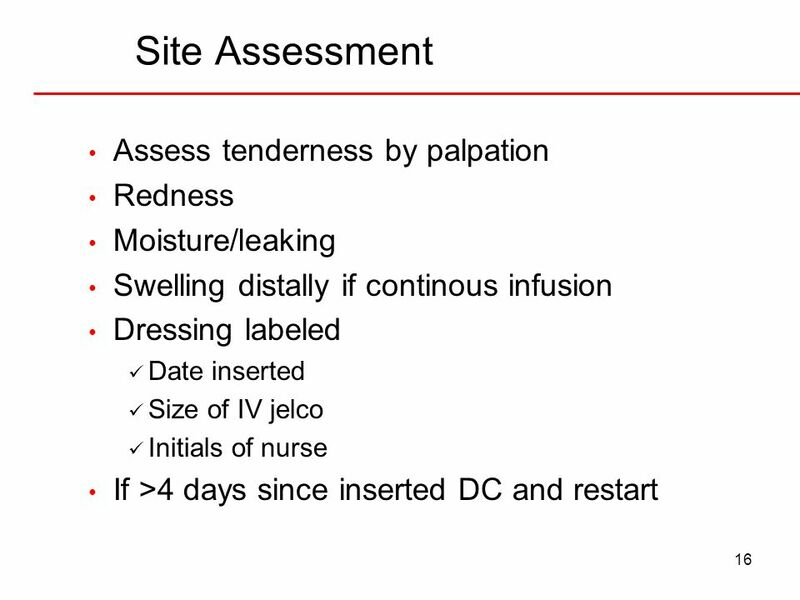 Identify significance of bubbling in the waterseal chamber and what assessments are required by nurse. 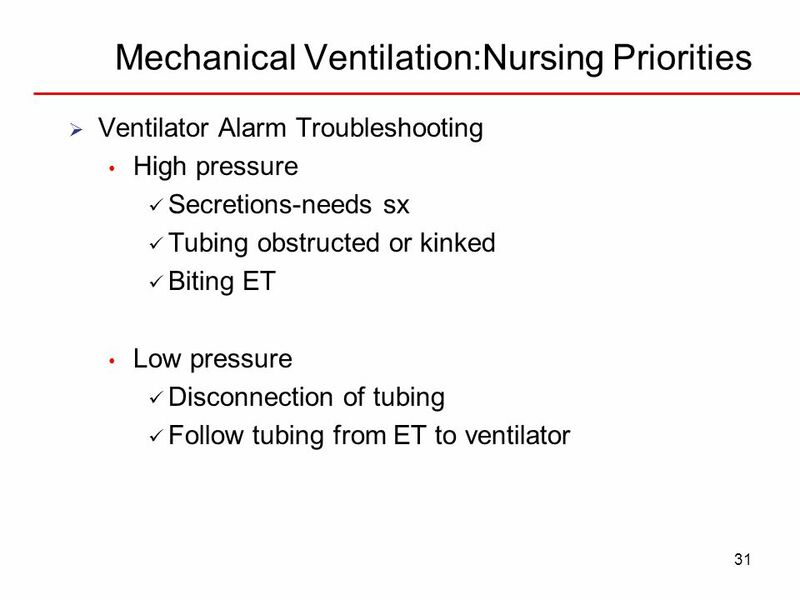 ET-Ventilator Identify indications for placement of endotracheal tube/ventilator. 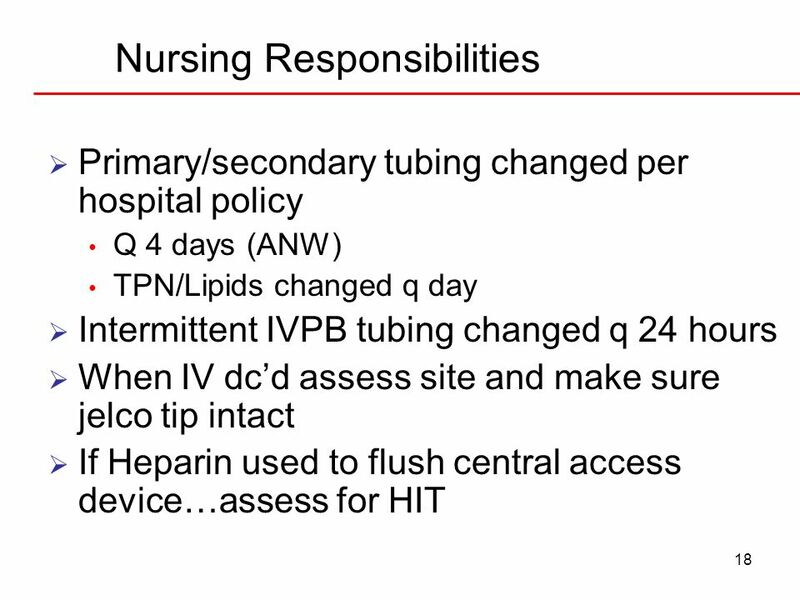 Describe nursing responsibilities and priorities for the client during intubation with ventilator. 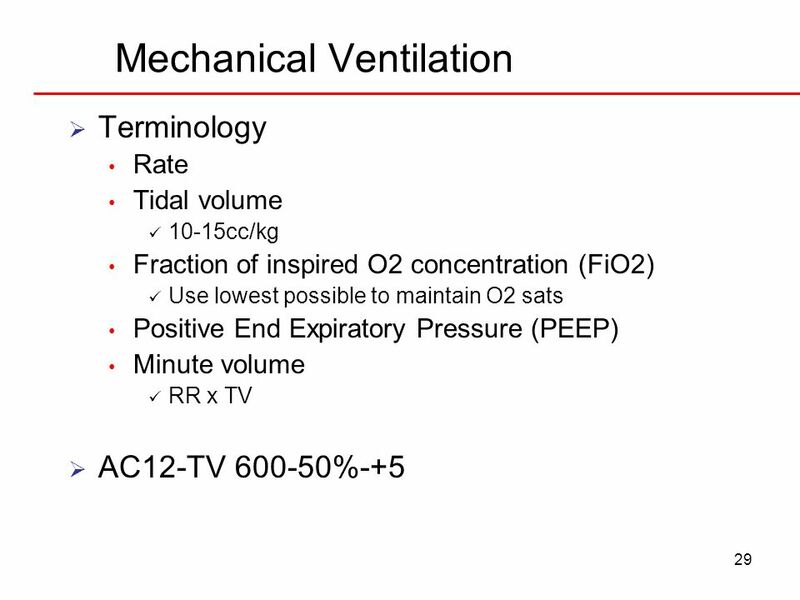 Identify principles of ABG interpretation and relevance to ventilator management. 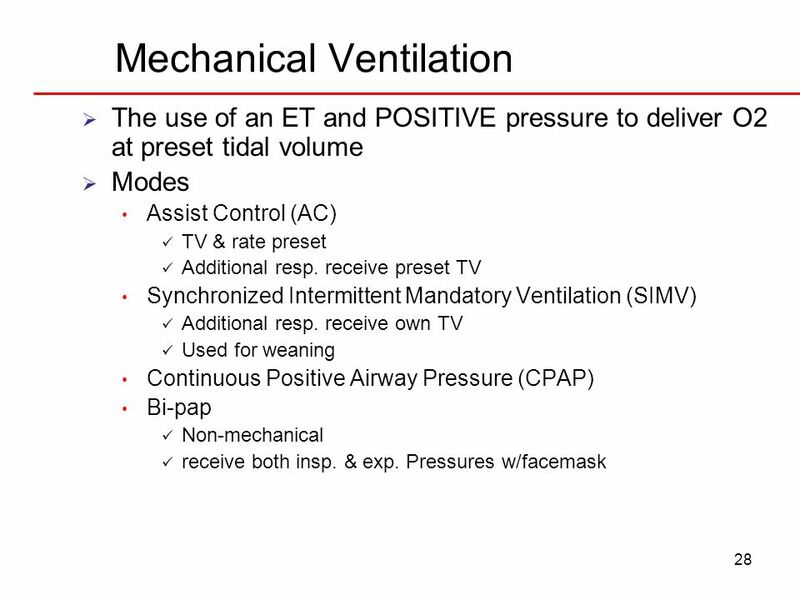 Describe different modes of ventilation and significance of ventilator settings. 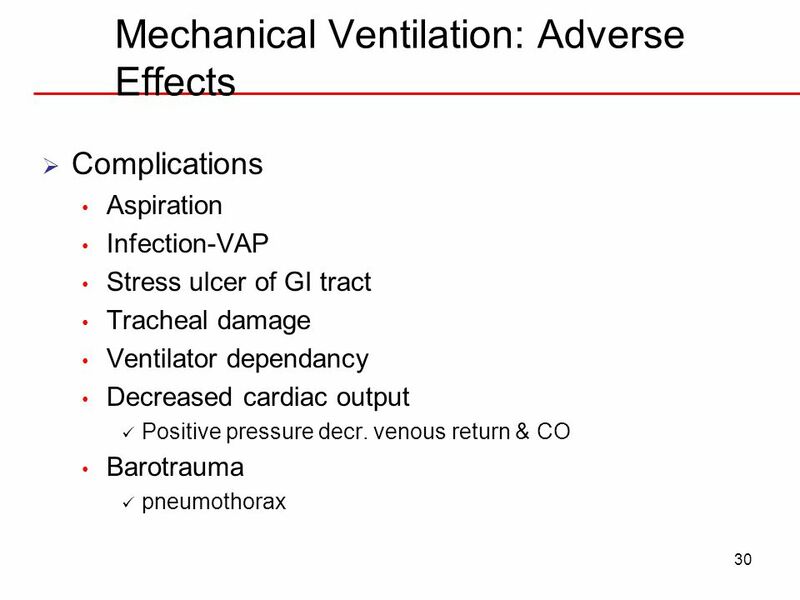 State potential complications and measures to prevent complications with ventilator. 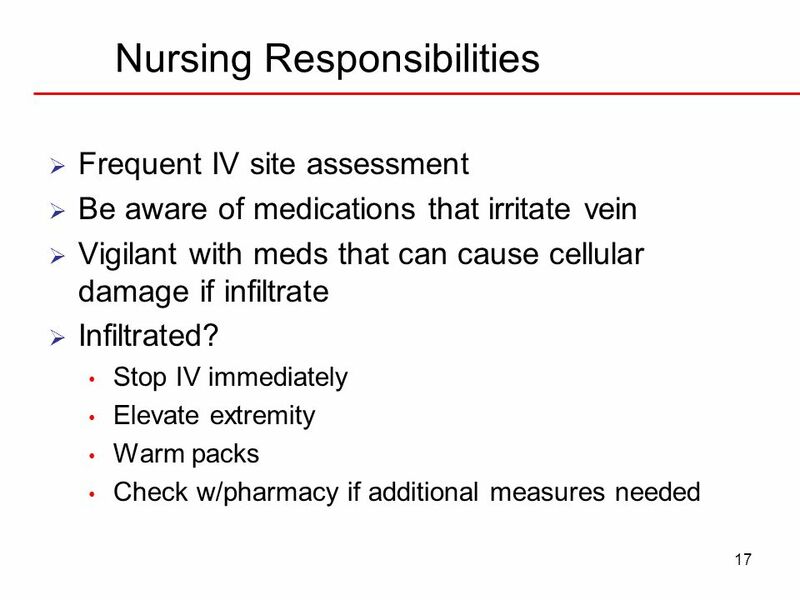 Frequent IV site assessment Be aware of medications that irritate vein Vigilant with meds that can cause cellular damage if infiltrate Infiltrated? 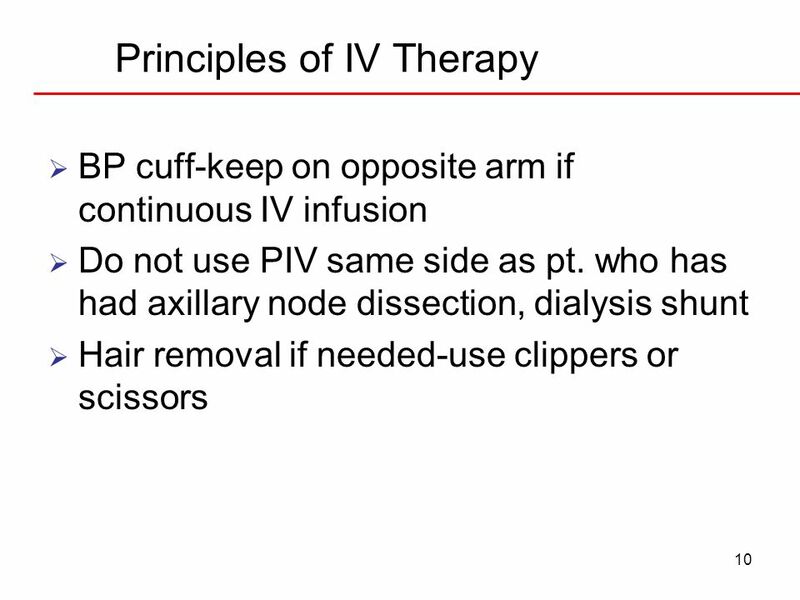 Stop IV immediately Elevate extremity Warm packs Check w/pharmacy if additional measures needed Irritants, such as nafcillin and clindamycin, shorten the dwell time, or lifespan, of peripheral IVs. They often trigger a mild pruritic allergic reaction related to histamine release. 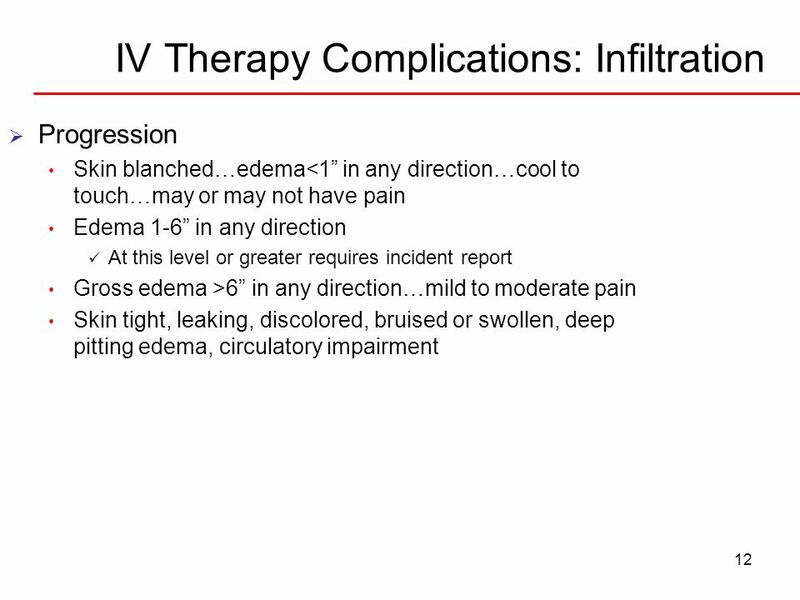 However, these “flares” usually subside in about 30 minutes and do not require intervention.9 Other common irritants are cefotaxime and amphotericin B. Extravasation refers to infiltration that occurs when vesicant medications or solutions are inadvertently infused into surrounding tissue.3 Common vesicants include diazepam, dopamine, vincristine, and calcium chloride. 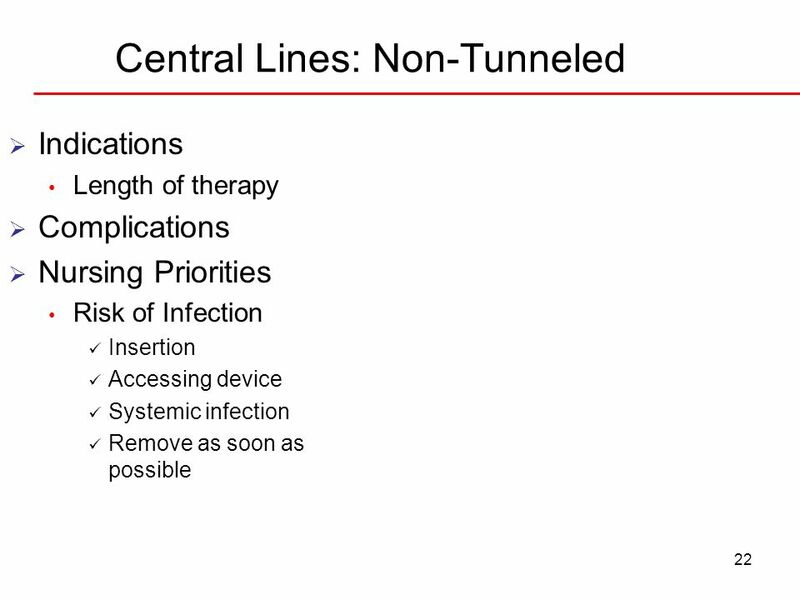 Even minute amounts of infiltrated vesicants can cause significant cellular damage. 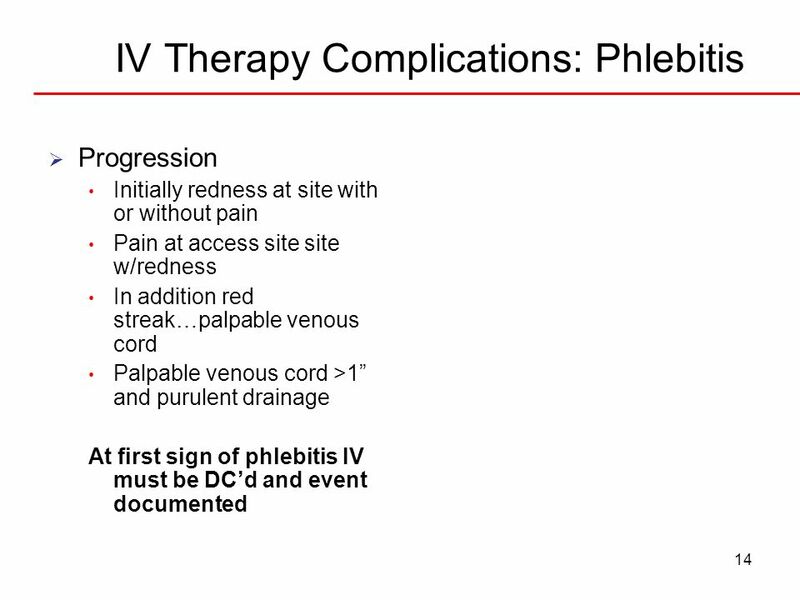 Whenever a vesicant is involved, the severity of the infiltration automatically becomes a Stage IV (4), the most severe stage (see Figure 1). Concentrated vesicants cause deep tissue damage. Depending on the vesicant type, there may be pharmacy protocols for administering an antidote, such as hyaluronidase, which promotes the rapid diffusion of extravasated fluids. 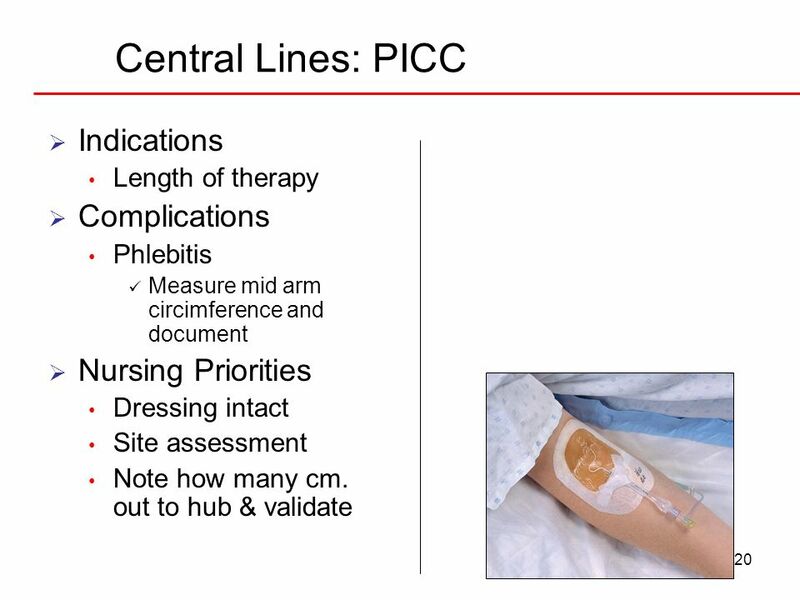 Increasing the surface area for more rapid absorption of the vesicant will reduce tissue destruction.1,10 Until the nurse knows whether an antidote will help, he or she must not remove the peripheral IV; in fact, antidotes can be injected through the catheter into the extravasated tissue. To help disperse the vesicant for quicker absorption, the nurse can elevate the extremity. 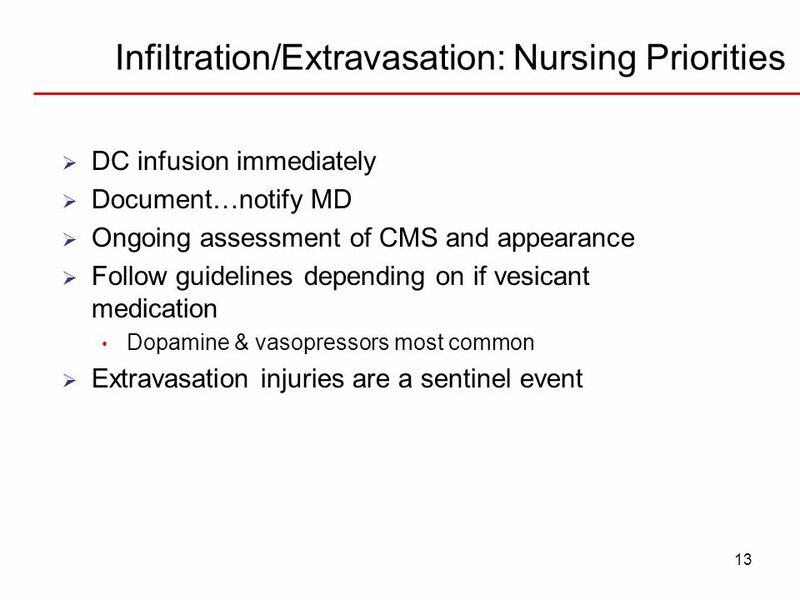 When there is an infiltration, it is important to consult with a pharmacist or pharmacy formulary to determine whether the infiltrated solution or medication is an irritant or vesicant before intervening. Minimum 22 g.(blue hub) IV-prefer 20g. (pink) or 18g. 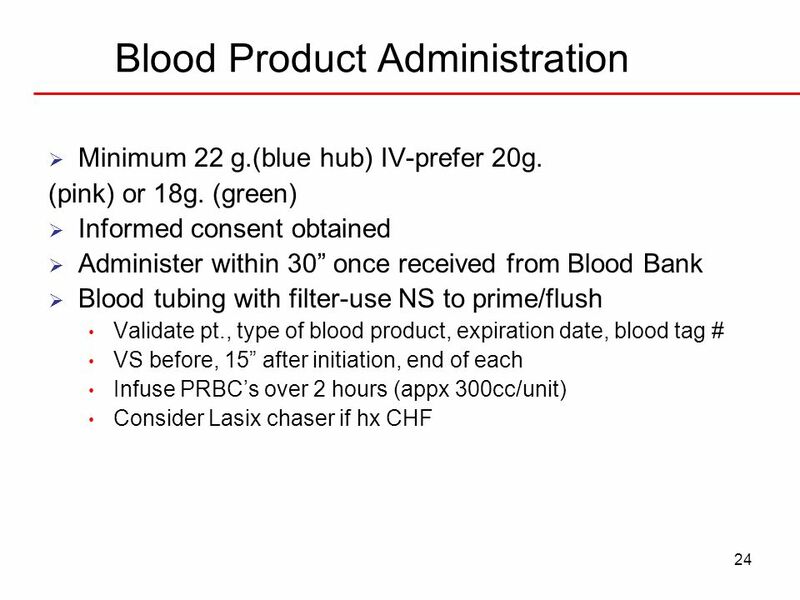 (green) Informed consent obtained Administer within 30” once received from Blood Bank Blood tubing with filter-use NS to prime/flush Validate pt., type of blood product, expiration date, blood tag # VS before, 15” after initiation, end of each Infuse PRBC’s over 2 hours (appx 300cc/unit) Consider Lasix chaser if hx CHF Refer to p.731 90% hemolytic transfusion reactions-worst life threatening due to giving blood product to wrong pt Asses closely first 15-30” infuse at rate no more than 125cc/hr Transfusion reaction—… … People older than 65 use 43% of all donated Blood. The demand for Blood and Blood products will increase as the population ages. 25% of all Blood products are used to treat cancer patients. 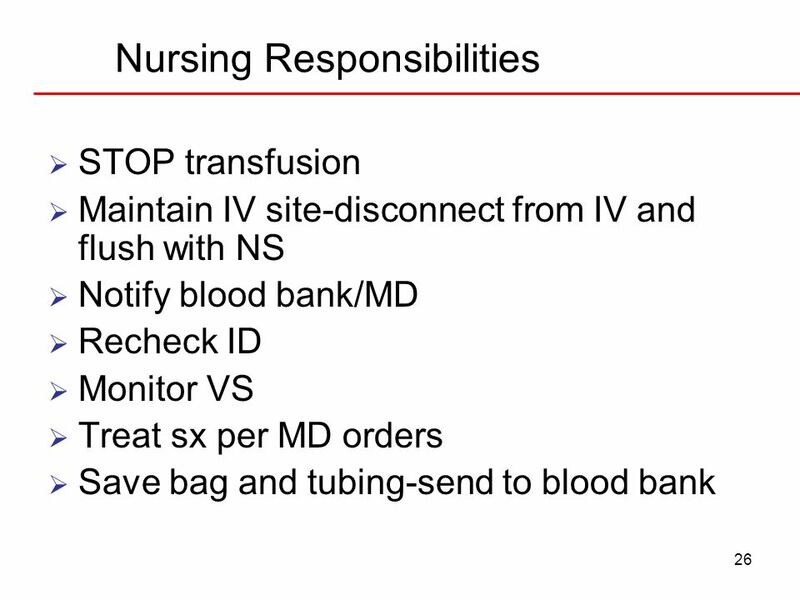 One out of every ten people entering a hospital requires Blood. The average liver transplant patient needs 40 units of red Blood cells, 30 units of platelets, 20 bags of Cryoprecipitate, and 25 units of fresh frozen plasma. heart surgery uses, on average, the red Blood cells and platelets provided by from six Blood unit donations. 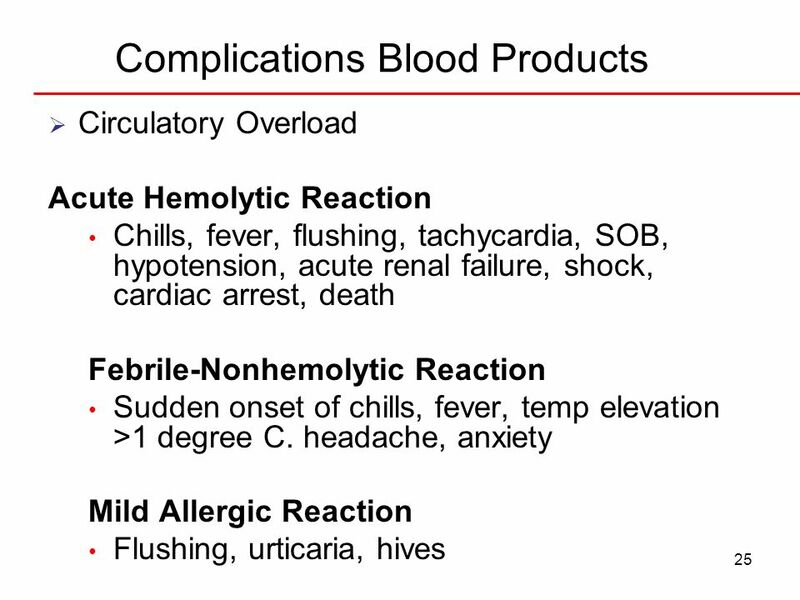 People who have been in car accidents and suffered massive Blood loss can need transfusions of 50 units or more of red Blood cells. The average bone marrow transplant requires the platelets from about 120 donations, and the red Blood cells from about 20 Blood unit donations. Assess resp. 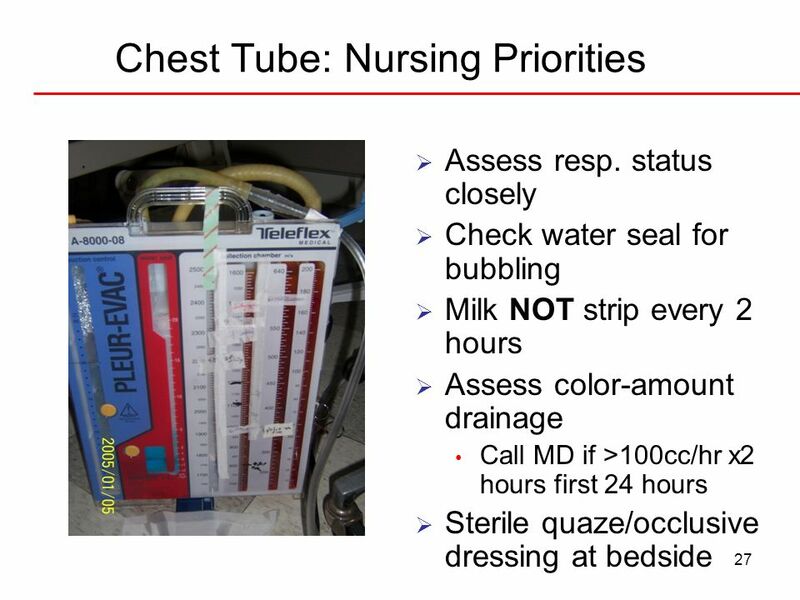 status closely Check water seal for bubbling Milk NOT strip every 2 hours Assess color-amount drainage Call MD if >100cc/hr x2 hours first 24 hours Sterile quaze/occlusive dressing at bedside Check water seal for bubbling…IF YOU CLAMP THE TUBING CLOSE TO THE PT-IT STOPS…WHAT DOES THIS TELL YOU? 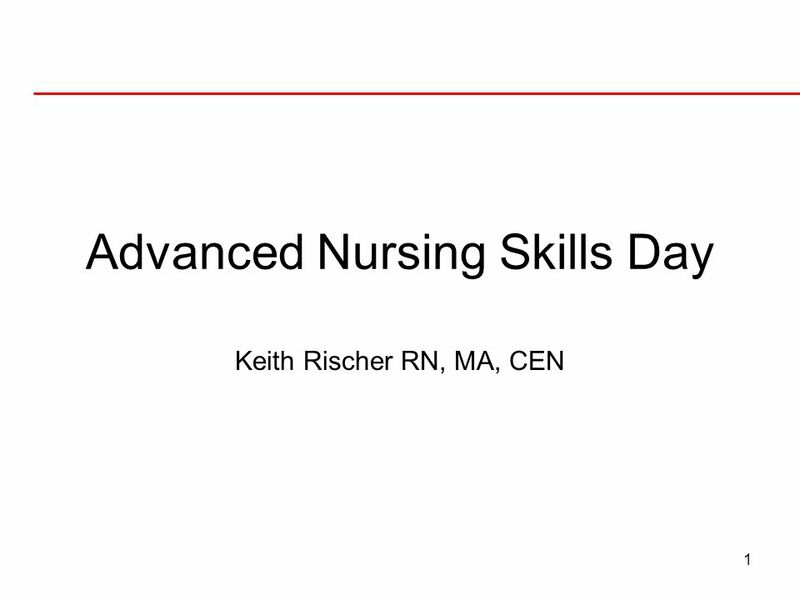 Download ppt "Advanced Nursing Skills Day"